Dogs have been missing out on Halloween for too long  but now pooch can join in the seasonal festivities at last. 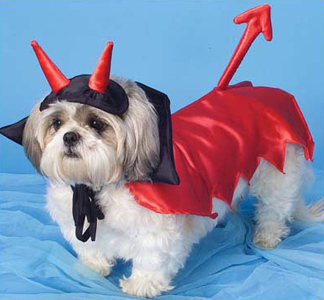 This fetching Devil costume is available in sizes ranging from Chihuahua to St Bernard. And the ensemble thoughtfully leaves the hindquarters free, in case of encounters with lampposts. Worn by the pampered pets of Hollywood stars, this and other Gadgets for Dog are ideal for the the fashion-conscious Hallowe'en hound. For maximum emotional distress, the Devil dog costume can also be worn at church services for the blessing of pets. Little Devil, made from red polysatin, is available for only $11.